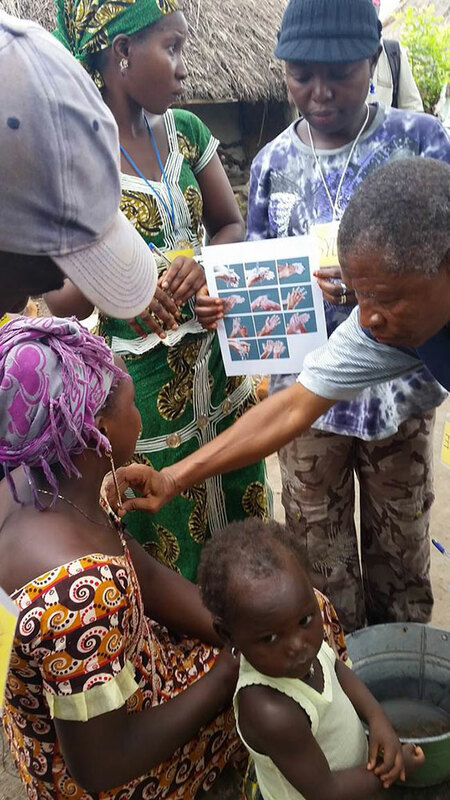 In 2016 and 2017, SPRING/Guinea worked with partners in Guinea to develop resources. 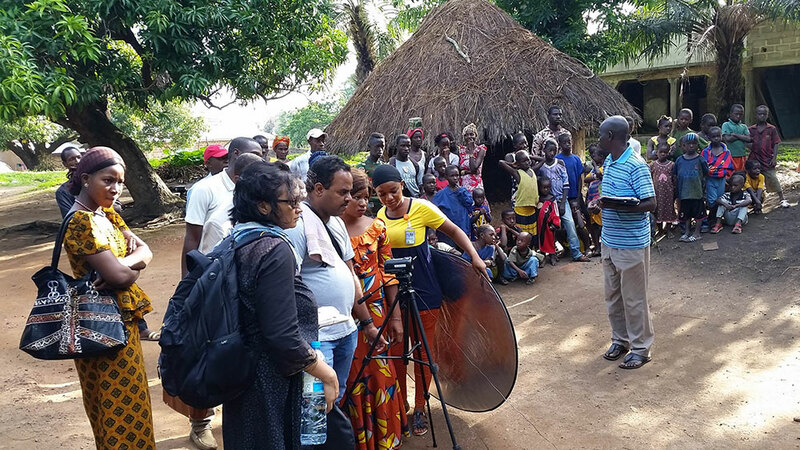 We conducted a training with our partner Digital Green on production and dissemination of community videos for maternal, infant, and young child nutrition, hygiene, and nutrition-sensitive agriculture for community agents in Faranah and Mamou, Guinea. 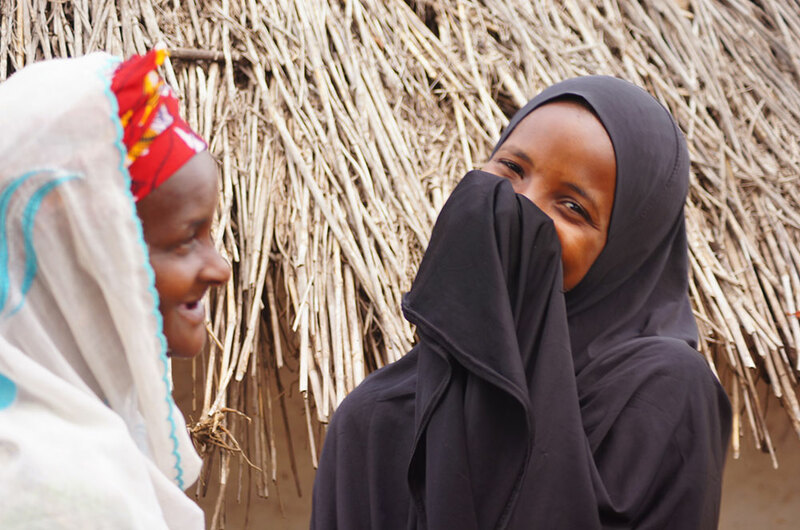 The activity involved adapting Digital Green’s community video production trainings and the tools provided in the Community Video for Nutrition Guide for the local context. 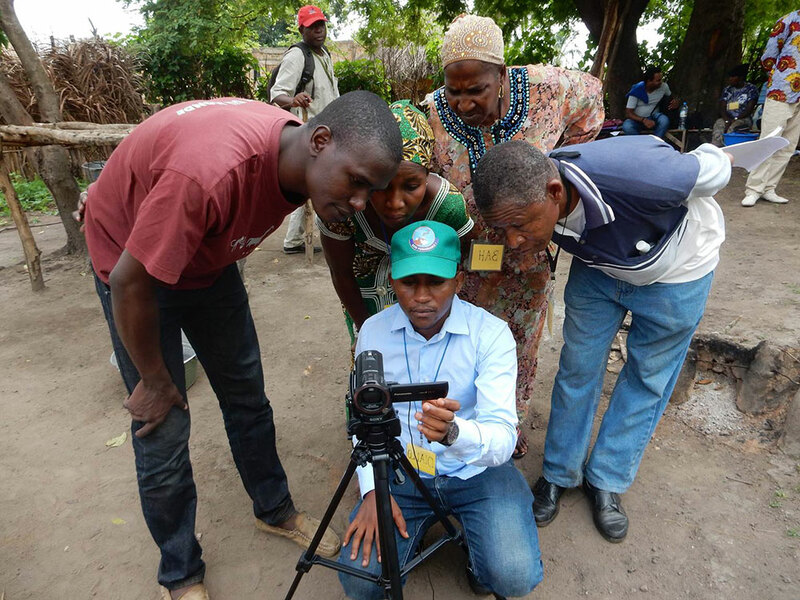 SPRING/Guinea’s efforts have resulted in the formation of two video production hubs now available for local partners to contract for the development of community videos. 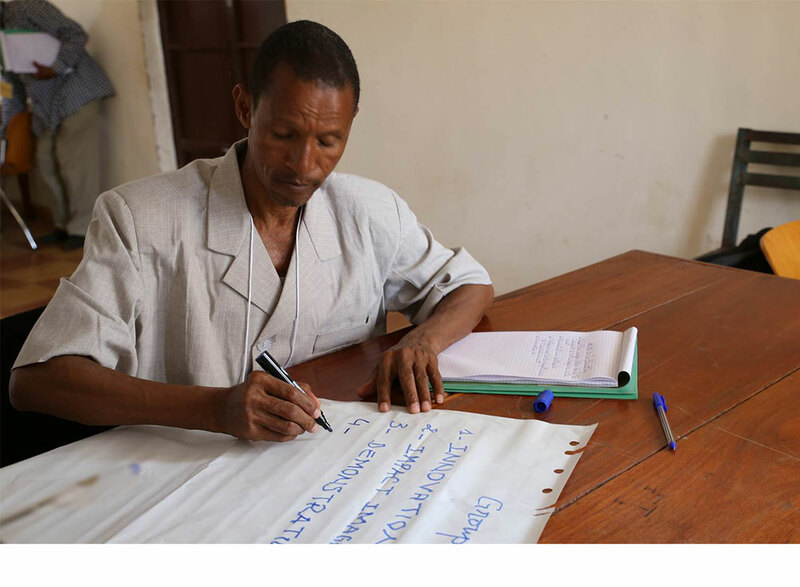 Dr. Mamadou Alpha Balde, Research Professor at ISAV, works on a script during the production training. The production workshop participants adapt the packages of practices and the storyboards for the videos. On the first day of shooting, the entire community arrived to observe. 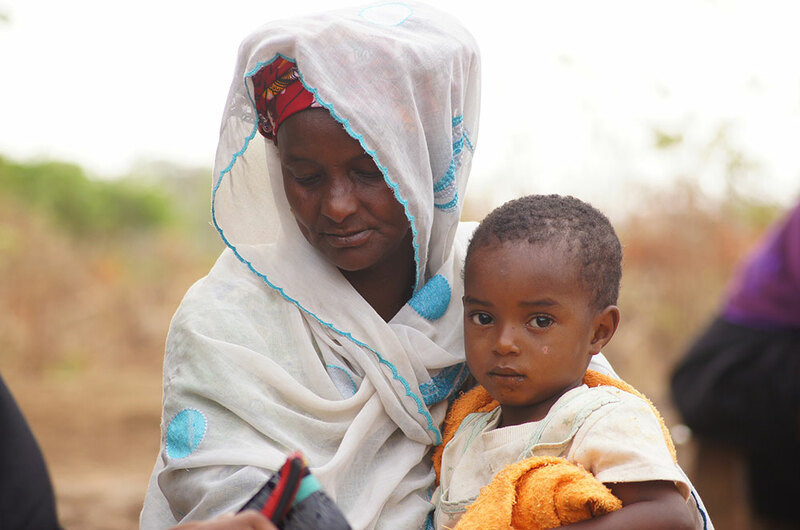 Dr. Namory Berete acted as the director for the first video on handwashing. SPRING partners also participated. 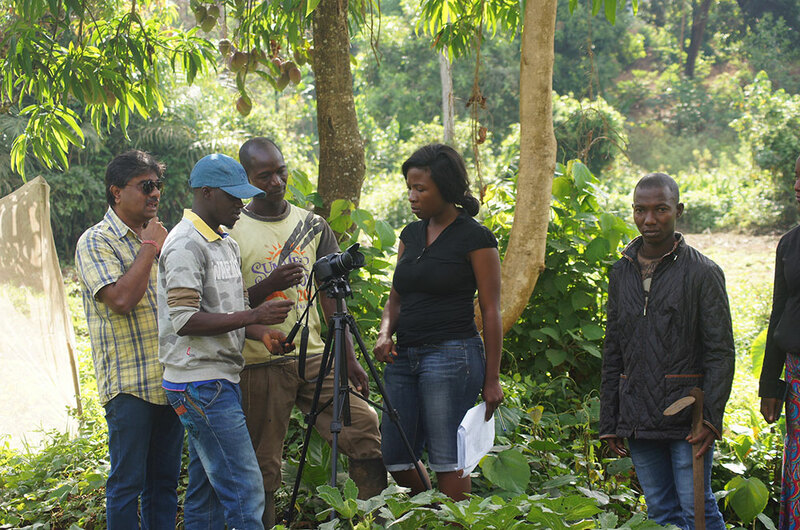 A partner from Digital Green is pictured here during the video production training. 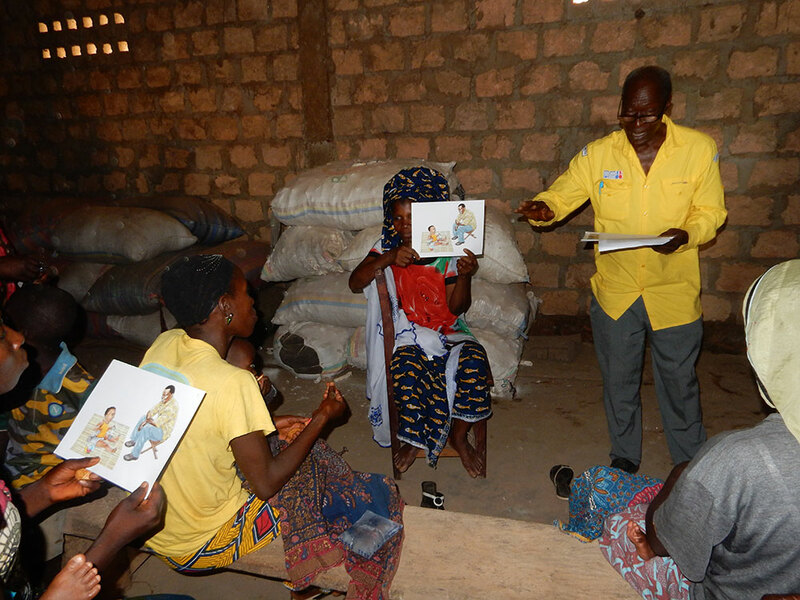 Video stars were trained on key messages using existing graphic training material. 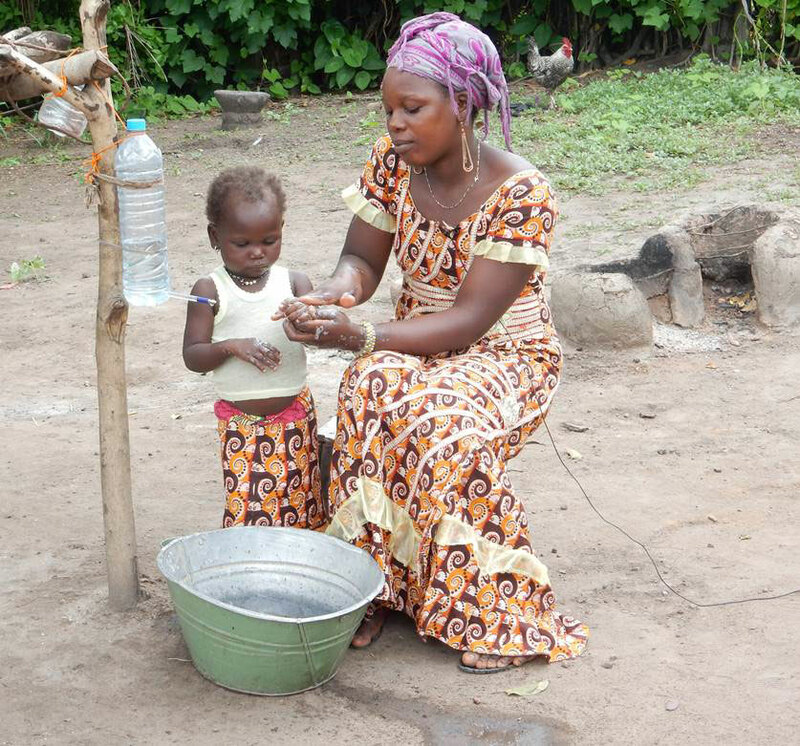 This community star demonstrates the proper handwashing procedure for herself and her child. Ronali and Praveen from Digital Green participate in the video production training with a SPRING intern. 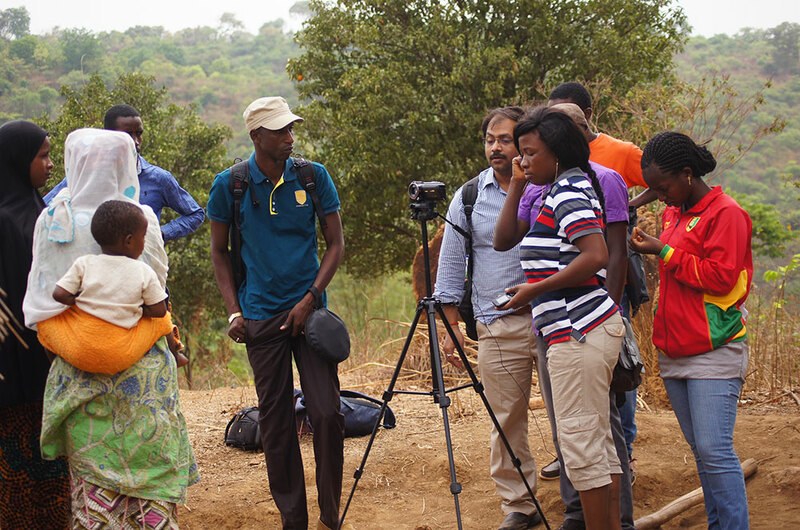 Twelve agents were trained in video production. One is a professional videographer. Ronali Pradhan from Digital Green helps the participants with video editing during the video production training. 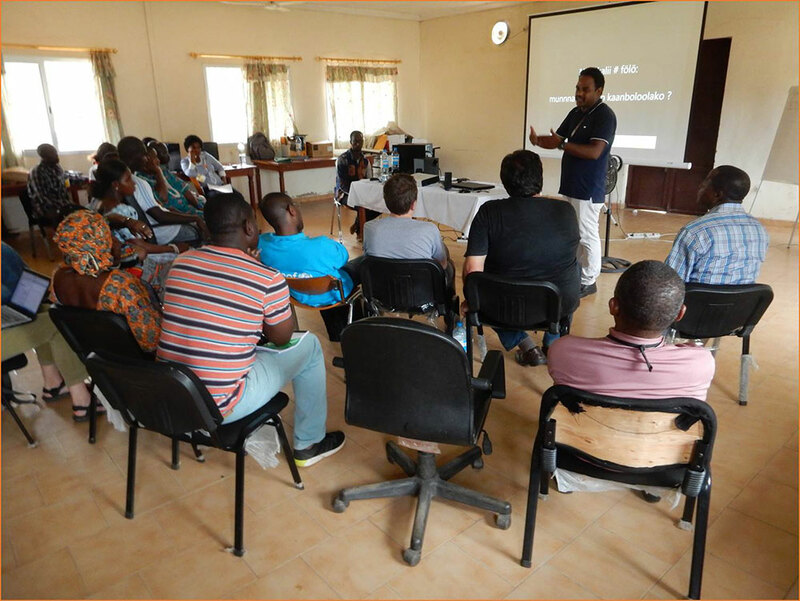 Following the MIYCN and video production trainings, a video dissemination training was held. 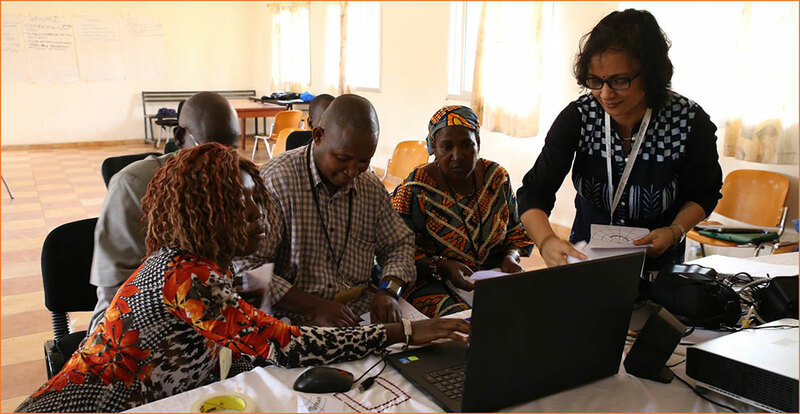 Participants learned how to disseminate key messages on MIYCN practices in their communities and then conducted live screenings. The whole community turned out for the first screening. 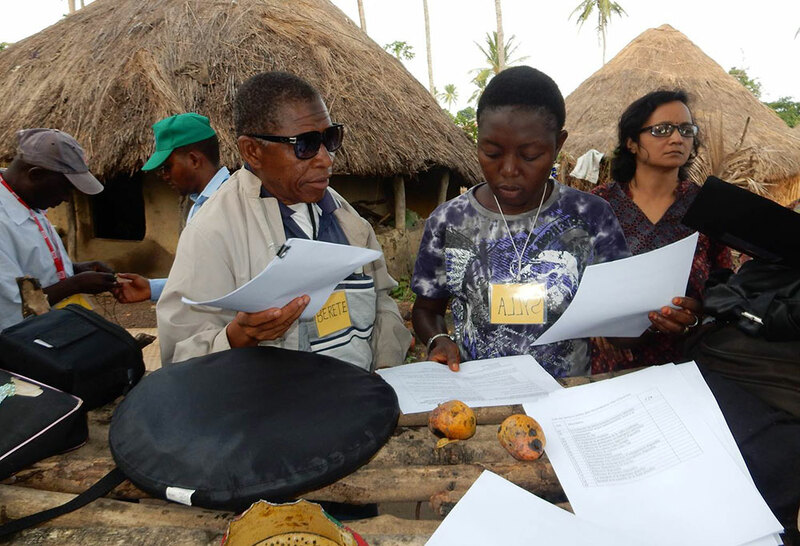 Training participants lead a second screening. This video promoted good handwashing practices. During the screenings, training participants practiced active facilitation techniques to answer questions and further explain behaviors to the audience. During the visit, some partners were invited to see the progress on the trainings and understand how the process works. Here, Praveen presents to Bill Bradley from USAID, the Head of Nutrition for the MOH in Guinea, and the Head of Nutrition for UNICEF in Guinea. Winrock and CMSA also attended. 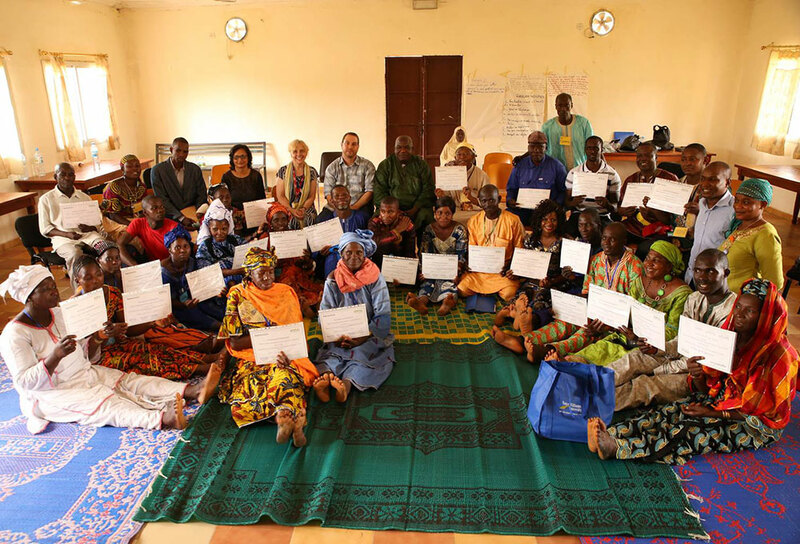 Participants received certificates for completing the MICYN training. 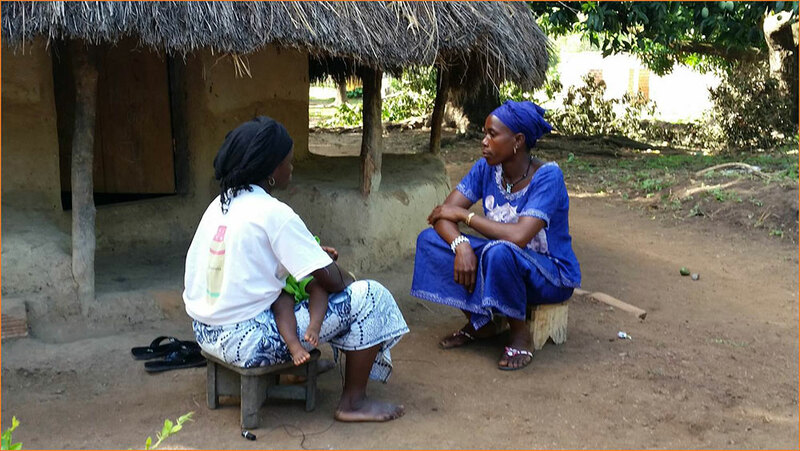 In April 2017, a new hub was formed in Mamou to serve partner projects in the central region of Guinea. 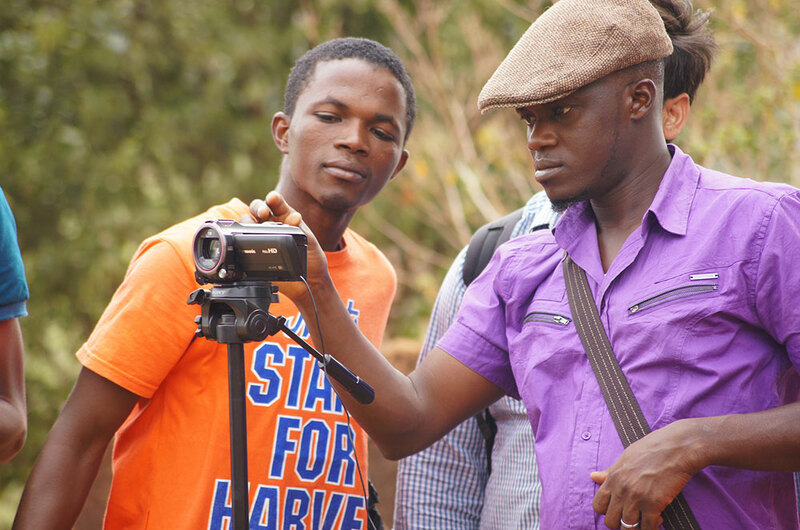 These hubs were trained in the technical and creative processes of video production. Here, two training recipients, Millimouno and Jeannette, practice handling the video camera. The training participants practiced story boards before filming shots for their videos. 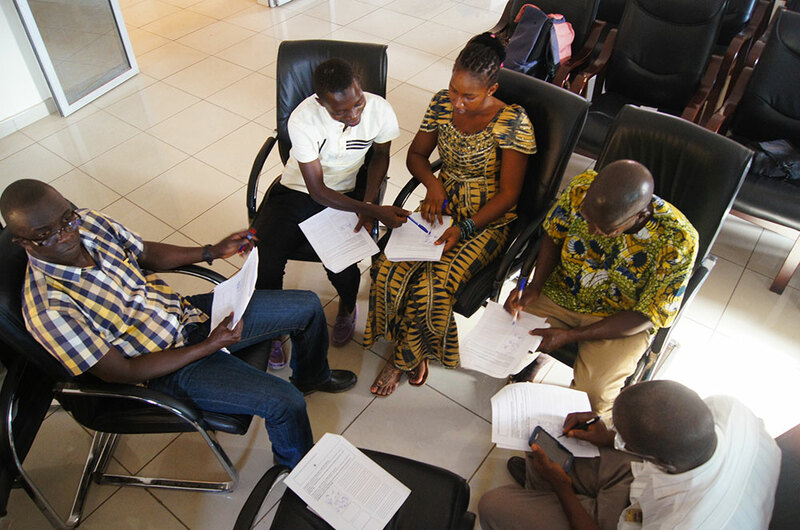 Participants have to develop an engaging story while incorporating key messages given from a package of practices developed by a technical team. Mamadou Bhoye Sacko and Boubacar Barry observe the framing of their shot as they practice filming a video to show how to properly wash hands. Kaushal Kundan Kumar from Digital Green helps the hub coordinate filming roles, including set management, camera work, and directing. It takes work to make a video, but community members are often happy to participate! 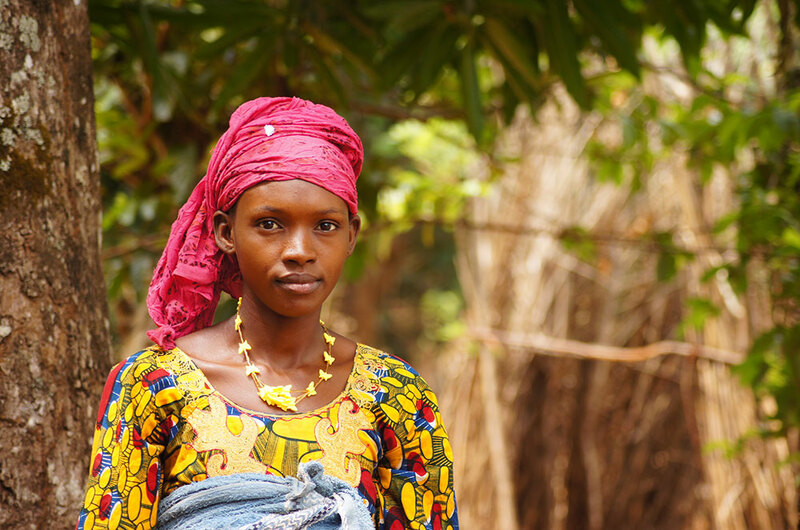 Meanwhile, a second group of training participants worked in another community close by to film a video promoting handwashing times, starring this woman. 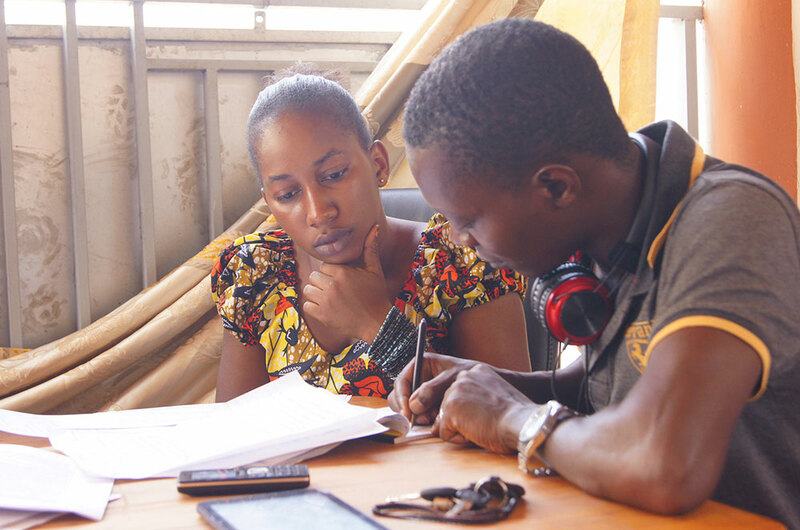 Tidiane Cissé, Peace Corps Guinea, works with the video’s star on directions for the next shot. 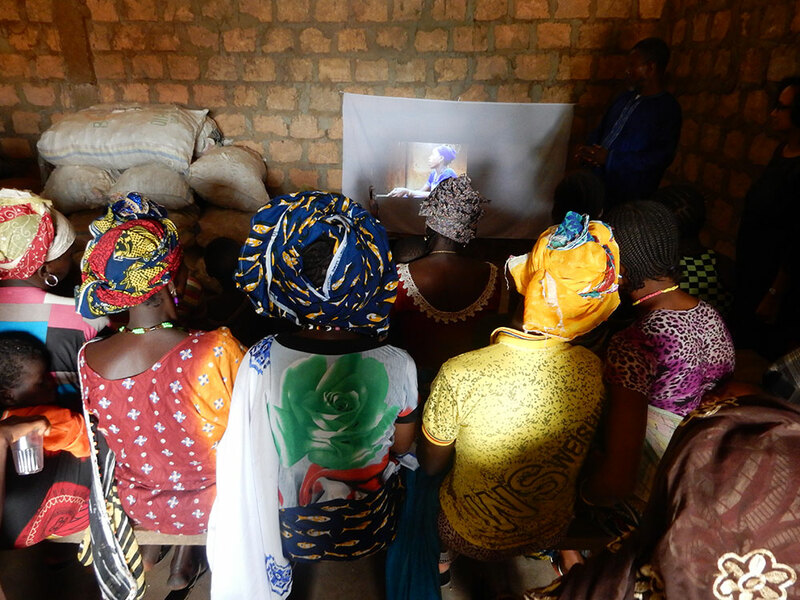 Peace Corps Guinea requested training on video production for use in their social and behavior change programming. 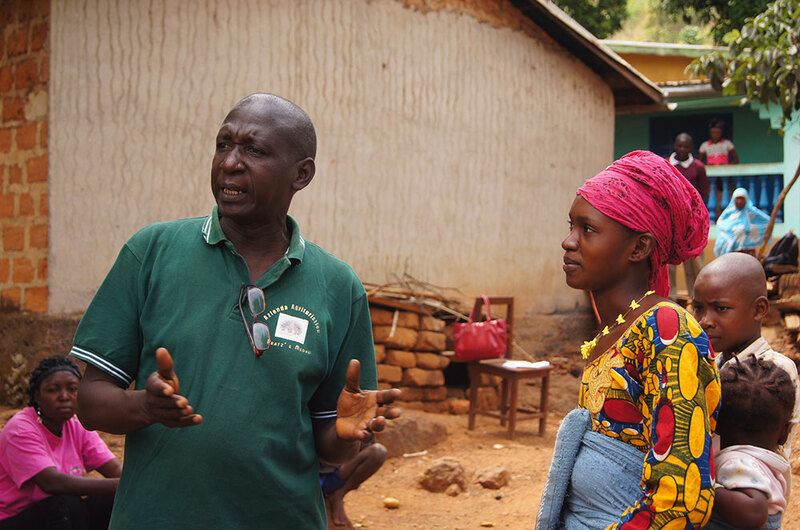 After the initial practice videos, members of the hub were given new video topics requested by SPRING’s partner in Guinea, Winrock International. 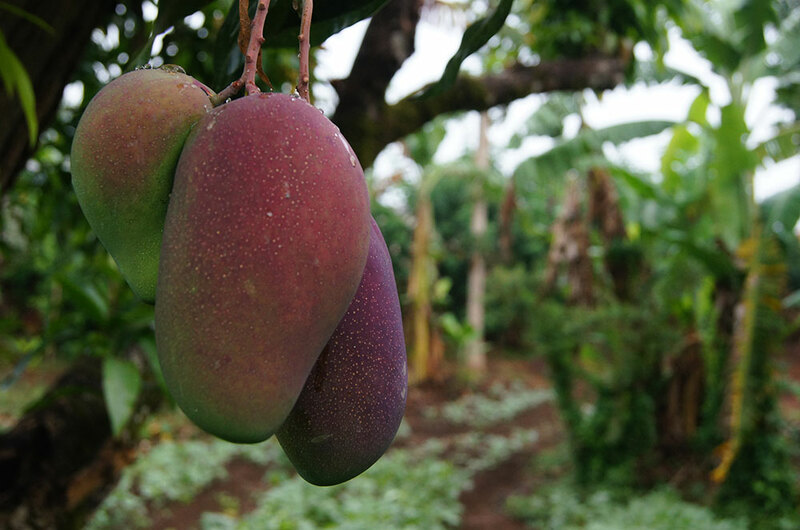 The videos both focused on mango production. One group produced a video on how to graft improved varieties of mango, and a second group produced a video on transplanting mango seedlings to a permanent location. SPRING was able to work with a local plant nursery in Mamou to shoot on location for both videos. Training participants practiced different types of shots in their videos. 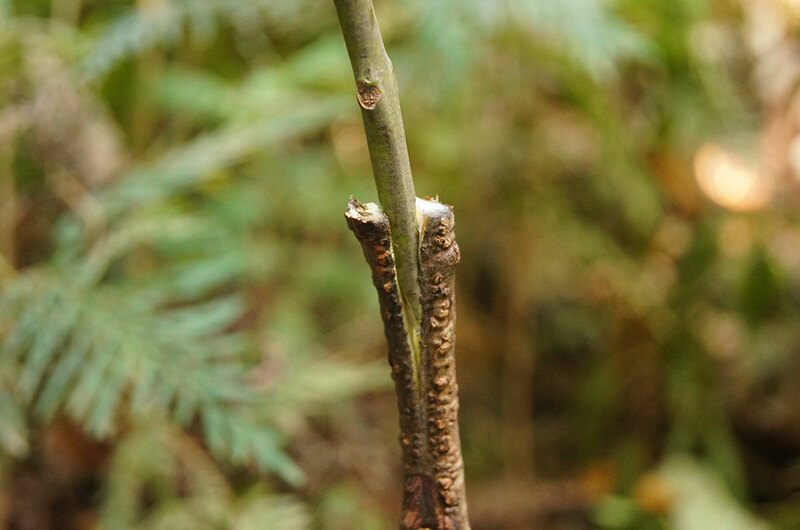 This close up shot is the best way to provide small details, like this method of grafting. 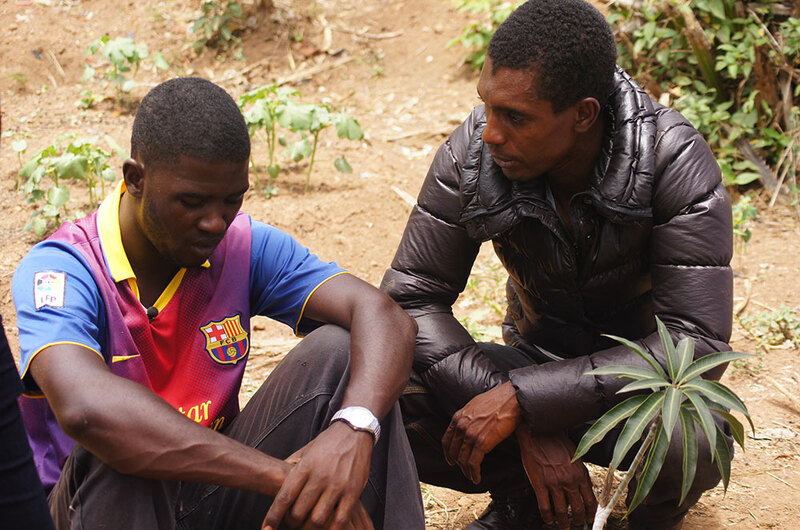 Two members of the plant nursery played the starring roles in the video on transplanting mango seedlings. After filming, the members of the hub have to edit the shots into a video. 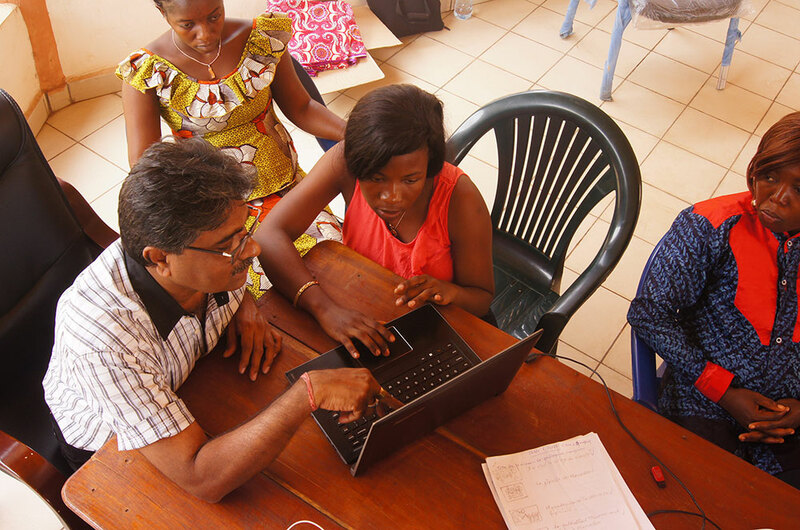 Here, Sharan Basapaa Nadagouda, Digital Green Consultant, works with Marie Tounkara and Jeanette on techniques for editing. 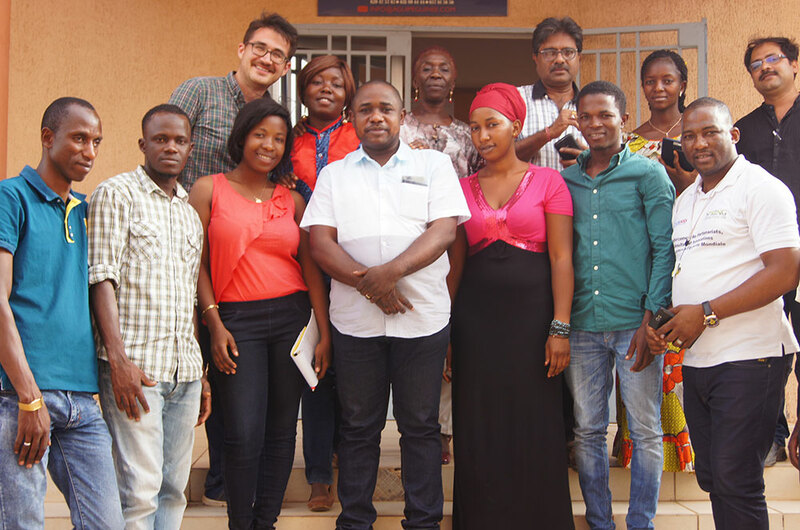 The members of the hub presented their videos to staff of the SMARTE project, run by Winrock International, who were excited to work with the hub to develop more videos in the future. 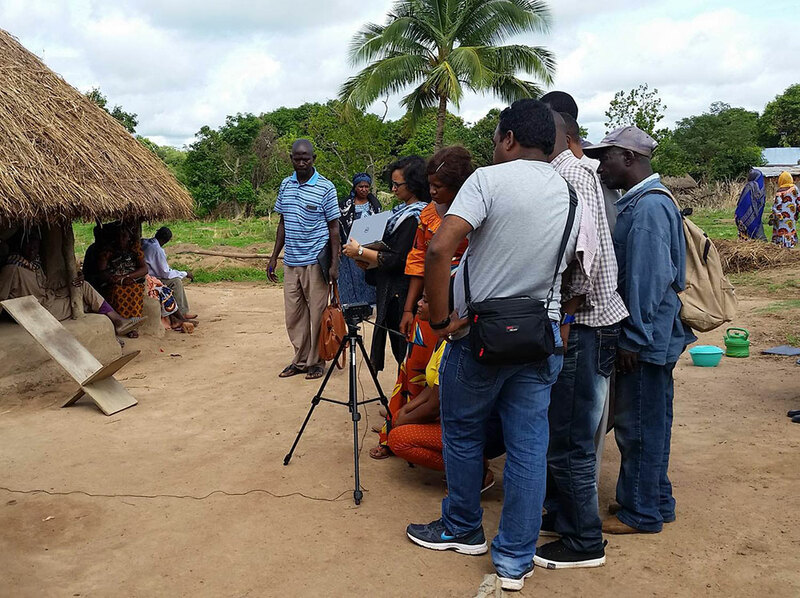 The establishment of a video production hub in Mamou allows SPRING’s partners to expand their reach in central Guinea to improve practices related to nutrition, hygiene, and agriculture.